Later known as the more English-sounding Nathaniel, Napthali Kornbluth was born in London’s East End to orthodox Polish-Jewish emigre parents who disapproved of him practising art. He therefore worked in the wholesale menswear ‘rag’ trade during the day, while studying art at evening classes variously at Hackney Technical School (1933), Central School of Arts and Crafts (1934-7), where he concentrated on etching, and at the Cass School of Art in the 1970s. He exhibited at the East End Academy from the 1930s and at the Whitechapel Gallery. 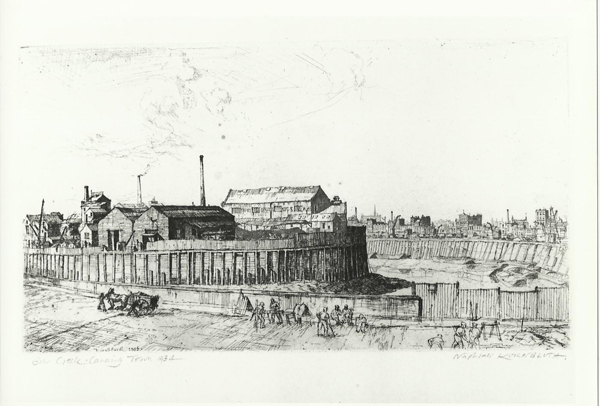 Much of his subjectmatter is inspired by his own East End neighbourhood, often featuring the hidden canals and industrial riversides of east London.